"Delving deep in to their subconscious to bring it to the conscious, the band again dazzle us with their gift for heavy riffs laced with soaring vocals and swathes of sound. The recording process of 'Peace On Venus' used the principle of the Quintessence, which is a principle cited by the 16th Century physician Paracelsus, who noted: "Nothing of true value is located in the body of a substance, but in the virtue thereof, and this is the principle of the Quintessence, which reduces, say 20 lbs. of a given substance into a single Ounce, and that ounce far exceeds the 20 lbs. in potency. Hence the less there is of body, the more in proportion is the virtue thereof. 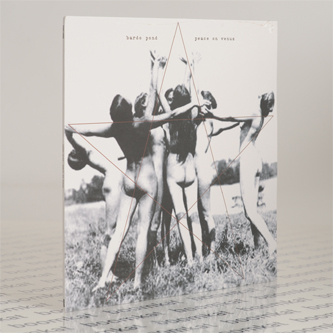 As Michael Gibbons from Bardo Pond says: "We wanted to make an album that held true to the single vinyl format LP, and have that be as potent a listening experience as possible. A Less is more statement in essence... The basic tracks were recorded live as a full band here in our studio the "Lemur House", and subsequently tracked here as well giving a live quality to the tunes.""